A/C Oil and Dye Injector R12 and R134a 2 oz. FJC2732 Brand New! 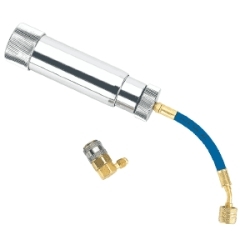 Home > Maintenance Products Air Driven Oil Injector > A/C Oil and Dye Injector R12 and R134a 2 oz. FJC2732 Brand New! are standard USA voltage (120 Volt) unless otherwise stated in listing. #2739 injector body replacement o-ring. #6074 Coupler o-ring repair kit. Free shipping applies only to the contiguous 48 States. Most orders ship within 1 business day. We have warehouses in multiple states. International orders that dont include shipping costs in their payment will not be shipped until shipping has been paid for, foreign duties are not included. International orders must be shipped from our International shipping office in California, if the tool is not in our International California warehouse and must be transferred, this usually adds 1-2 business days but in some cases may add up to 7 days to total international shipping time. If you would like to know if the item is in stock in our California warehouse, please let us know. We will provide you with that information. Please note that any our tools that require AC power are made to USA specifications and are 120 volt. If you need a 240 Volt unit we can see if one is available.Items are not returnable after 30 days from date of purchase. Scanners, code readers and software is non returnable once opened and or registered. Please read complete return policy here.